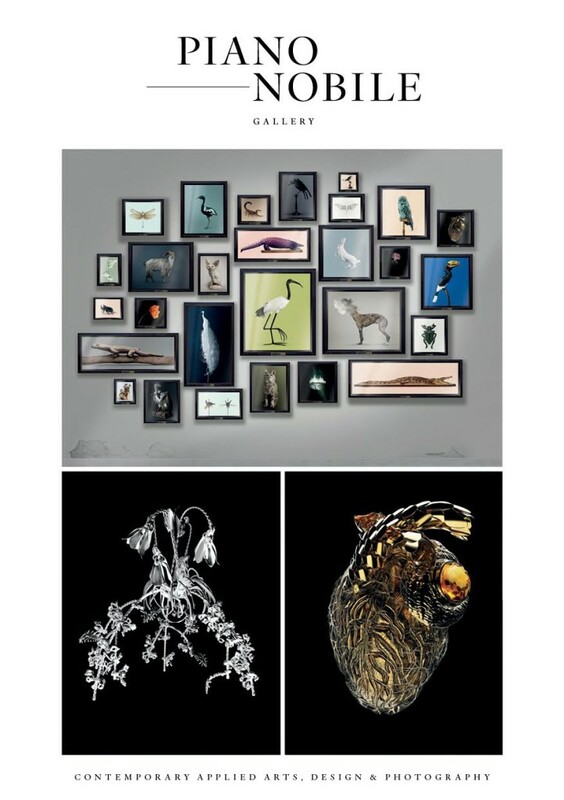 For its first exhibition, Spazio Nobile located on the ‘piano nobile’ of a 1920s house in Brussels hosts French artist Vincent Fournier for his Post Natural History exhibition, presented in the format of a contemporary cabinet of curiosities. The showcase runs through a large universe, linking photography with 3D application, and opens a conversation with other unique and limited editions pieces by Nathalie Dewez, Kaspar Hamacher, Carlo Brandelli, Tomáš Libertíny, Juliette Clovis and Glass is Tomorrow. The result of a great attention to contradictions and the imponderable, Fournier’s works are poetic and meticulous, freely nurtured by cinematographic and literary inspirations. Fascinated by science, architecture, technology and its mysteries, his installations explore all fictional potential. His works can be found in many permanent collections, and are regularly exhibited at major galleries or institutions, including the Metropolitan Museum of Art in New York, Fondation Louis Vuitton Paris, Mori Art Museum of Tokyo, the Rencontres d’Arles, the Fondation EDF, the Musée des Arts décoratifs Paris, to only name a few. Post Natural History recounts the story of a voyage through time and projects a near and imaginary future. A subtitled “archaeology of the future,” this exhibition mixes history and anticipation, memory and science fiction. It reveals a collection of creatures that are “beginning to appear,” imagined through synthetic and cybernetic biology. Composed of three declinations around the possible transformation of the living world, the exhibition questions the relationships of man with nature and with technology, and emphasises the futility of vanity. The presentation, with “scientific” explanations accompanying images, paradoxically reinforces reality as well as fiction. This first exhibition is particularly representative of the universe that Spazio Nobile aims to present. Reinforced with iconographic references and documents, it includes a significant narrative dimension as well as a prospective vision, questioning the passing of time, the values of authenticity and the transmission of knowledge, materiality and the invisible. Post Natural History is an exhibition completely in line with the gallery’s positioning, a search for meaning and a link between the past and future. Staying true to their path, nurtured by artistic complicity and intuition, Lise Coirier and Gian Giuseppe entrust Belgian Michel Penneman with the interior design of the gallery. Known for hotel projects: thewhitehotel (for which Lise collaborated), the Pantone, the Tenbosch, the Zoom, the Vintage, Penneman is characterised by a convivial, open to the city, spirit. His activity as a creator of 3D images adapts interiors for contemporary and urban lifestyles. While retaining the character and details inherent in the architectural style of a 1920s town house, Penneman developed a refined setting, neutral but warm and nuanced; emphasizing the three-room suite opening up to the city garden, to enhance the quality of the space for exhibitions. A long kitchen and “endless table” equally play a role in the setting of the space, which will also host cross-discipline dinners and friendly gatherings. For its interior design, the gallery also turned to three Belgian designers and three Belgian manufactures, who marked the space with installations offering a sensorial impact and an entirely subjective experience. Nathalie Dewez refined the space with lighting objects and a mirror with silvery oceanic effects, while Kaspar Hamacher sculpted wood to produce beautiful dugout pieces, as the office and the shelving system. Brussels label Vervloet permeated the setting all the way from the door of the street entrance, with a very tactile double participation: Portofino nobs and a special series of door handles designed by goldsmith Nedda El-Asmar. 2Tec2/Limited Edition and Delta Light are also enhancing the quality of the space both for the flooring and lighting design of the ‘piano nobile’.